This thoughtful rosary and card set comes with a handcrafted rosary and a sturdy prayer card, both exclusive to The Catholic Company. 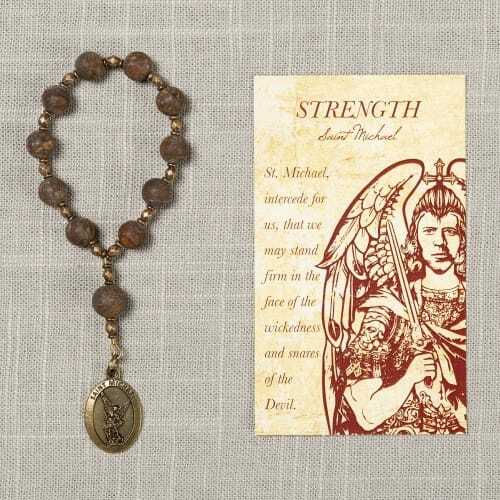 The rosary features marbled bronzite beads with antique gold tone and antique bronze spacer beads, and a brass medal of St. Michael, patron saint of spiritual strength in the face of temptation and all of the battles we face, externally and internally. A neutral design for men or women, perfect for slipping in a pocket or keeping on a bedside table. Front: St. Michael, intercede for us, that we may stand firm in the face of the wickedness and snares of the Devil. Back: "Glorious Archangel Michael, warrior of God, who valiantly defends the Church of God, I earnestly entreat you to assist me also. Obtain for me from God a share of your sturdy courage; pray that I may have a strong and tender love for our Redeemer and, in every danger or temptation, be invincible against the enemy of my soul. Be with me, O mighty Prince, so that I will persevere in the fight to vanquish sin, which lurks both around me and within me. Uphold me, so that neither fear nor doubt, discouragement nor fatigue, may ever draw me away from Christ and His Holy Church. Amen." I bought this for a friend who is going through a tough time. It means a lot to her. The bronze coloring evokes feelings of ancient strength. The depiction of St. Michael lends to the elegance with which the Archangel will triumph over evil. These attributes combined with the included prayer card will aid you in your hour of need. Highly recommended.